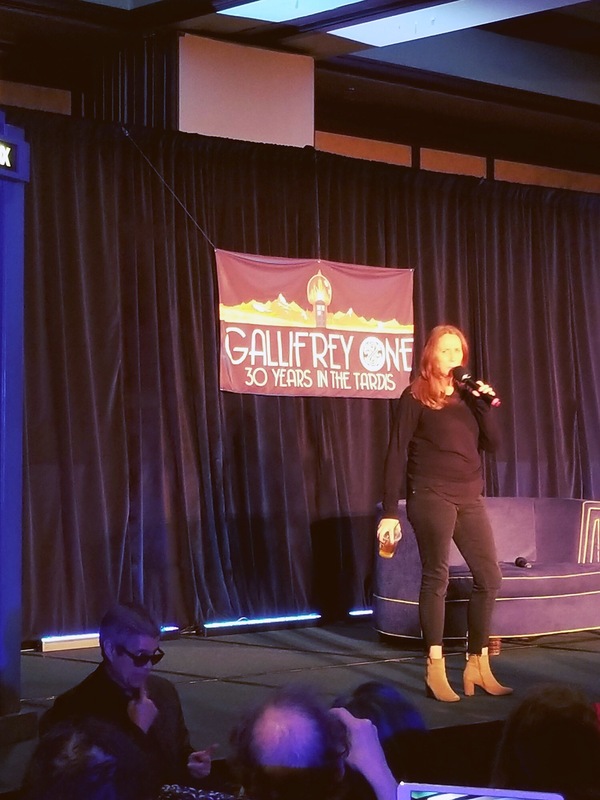 Although we’re past the halfway point in March, it’s (past) time I wrote about my trip to Los Angeles in February to attend Gallifrey One. 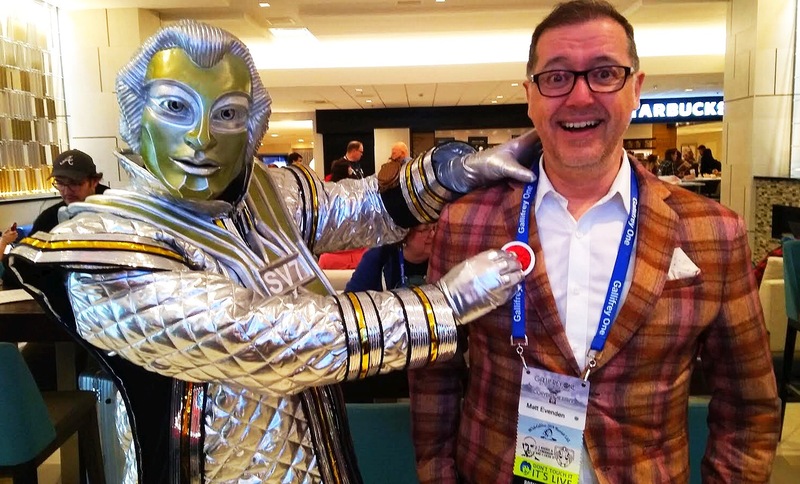 Savvy readers of this blog will know that this was not my first trip to this convention (far from it, in fact – this was my 18th consecutive year attending! ), but I just can’t get enough of it! 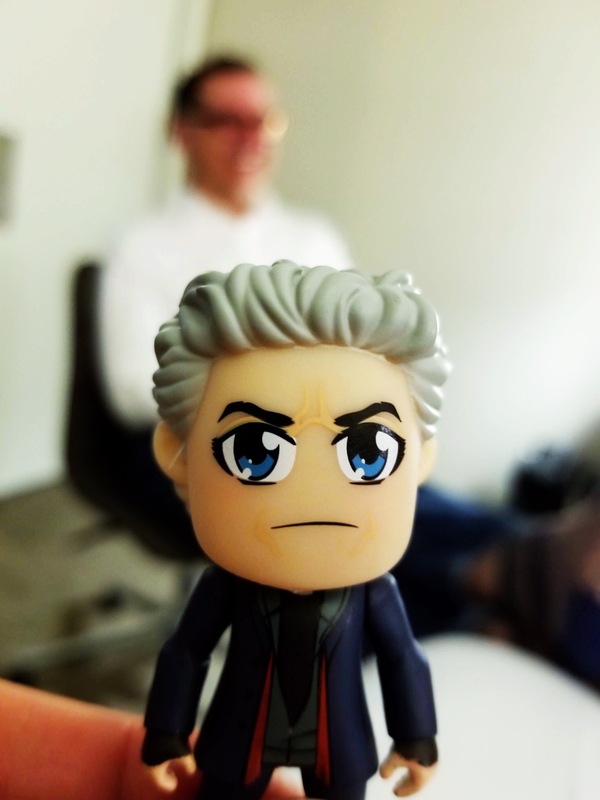 I truly look forward to it all year long as it’s a chance for me to not only surround myself in Doctor Who-ness for a weekend, but also to see friends that I only see once or twice a year. 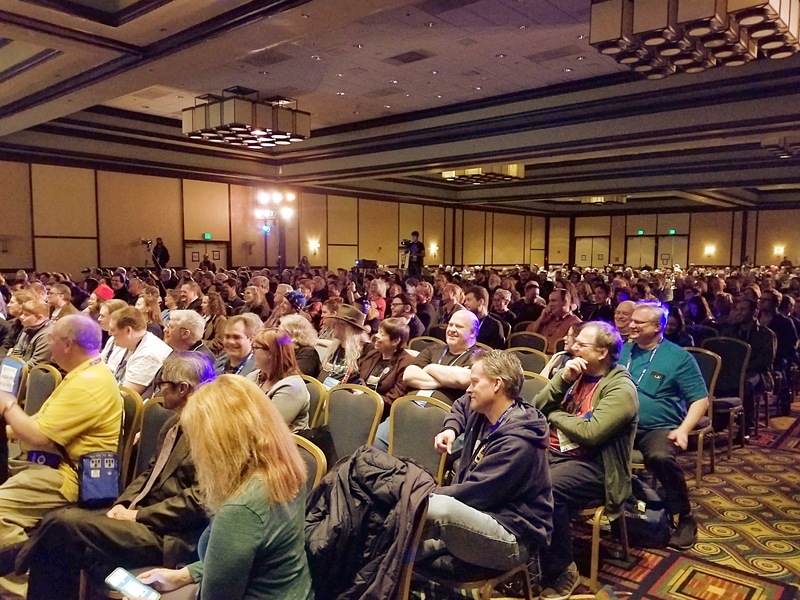 And, as always, this year’s convention didn’t disappoint, with lots of fun memories with friends, great convention guests, and weather that was better than forecasted (the weather can vary wildly, from cold and rainy, to hot and sunny). 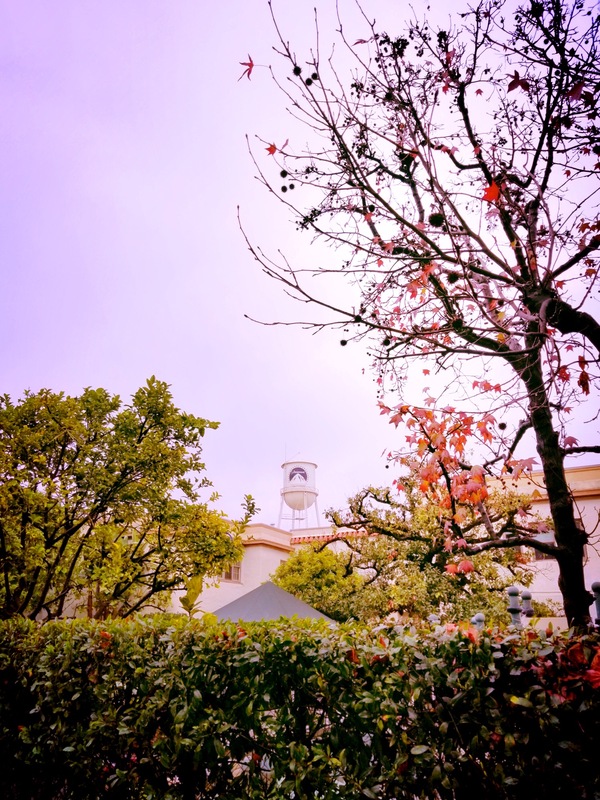 As usual this year, my trip started with something not at all related to the convention – a visit to Paramount Studios! 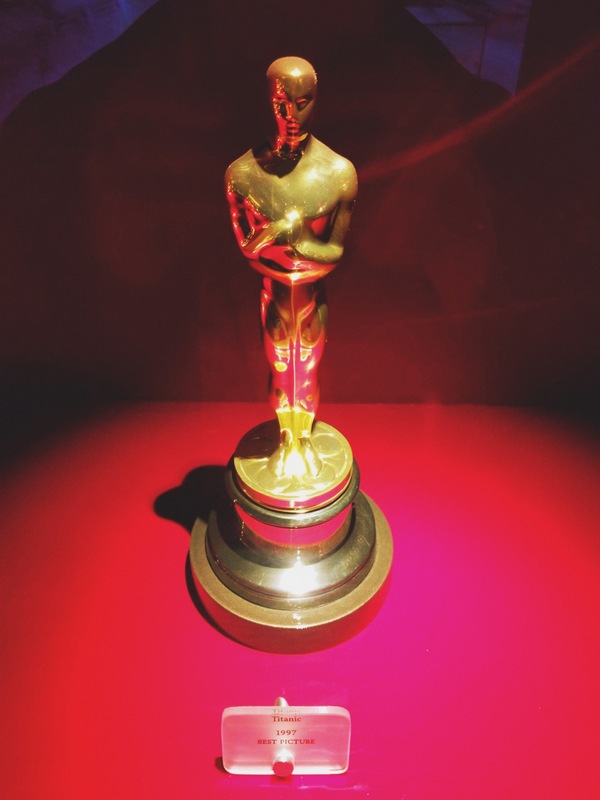 My friends and I do something fun in the LA area pretty much every year, like the Hollywood Museum last year and a tour of Warner Bros Studios in 2017, and this year’s selection was another good choice. So, Paramount Studios. Their claim to fame is that they’re the only studio still truly inside Hollywood, since other studios have moved further out to places like Burbank (where Warner Bros Studios is). Neat! 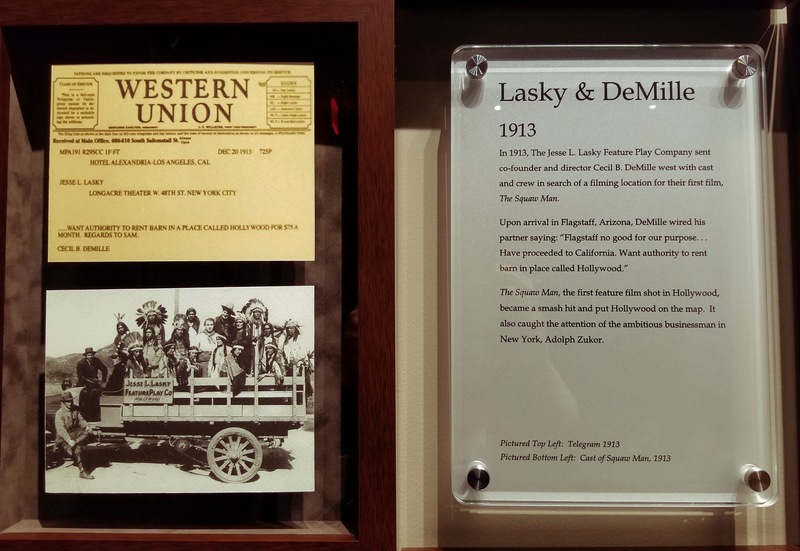 Additionally, there’s some neat history associated with Paramount because of the way they grew their studio through the purchase of Desilu Productions (founded by Lucille Ball and Desi Arnaz and the heart of classic TV shows like I Love Lucy, Star Trek, and Batman) in 1967. 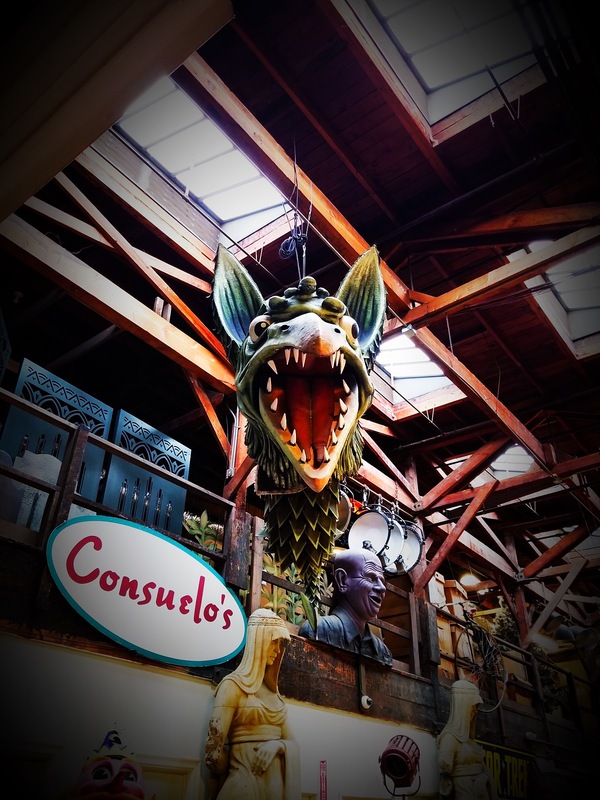 If you’ve been on any kind of studio tour before, you’ll find the Paramount tour to be pretty similar, though of the tours I’ve been on, I found it to be the weakest. That’s not to say I didn’t enjoy it though as I certainly did! 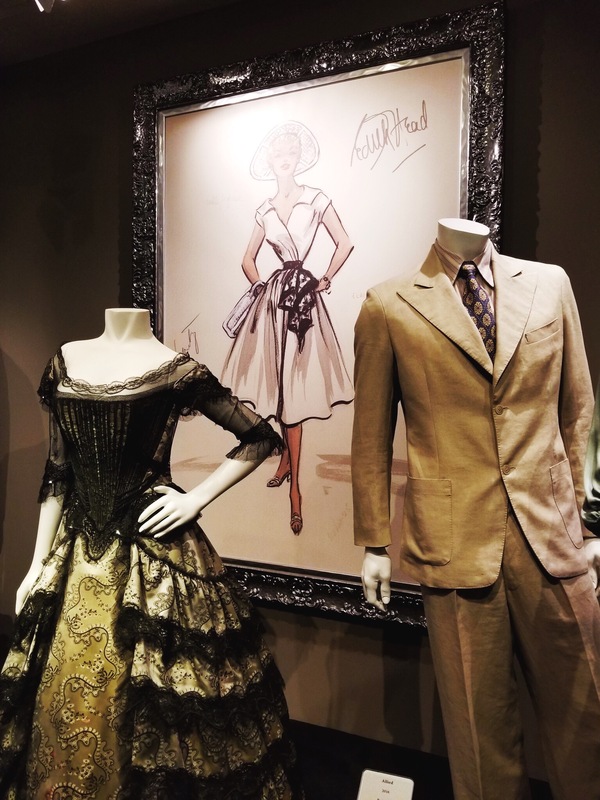 But while it seems like other tours give you the chance to see a fair amount of sets and learn about the studio and its history, the Paramount tour seemed to take place mostly in our golf cart, with commentary from our tour guide (who was very good). My opinion may also be biased because of the dreary weather (we were in off-and-on rain for most of the tour) and because there was some fancy art show happening, so there were lots of non-Paramount folks getting in our way (not to mention the bright pink signs for it all over the place). 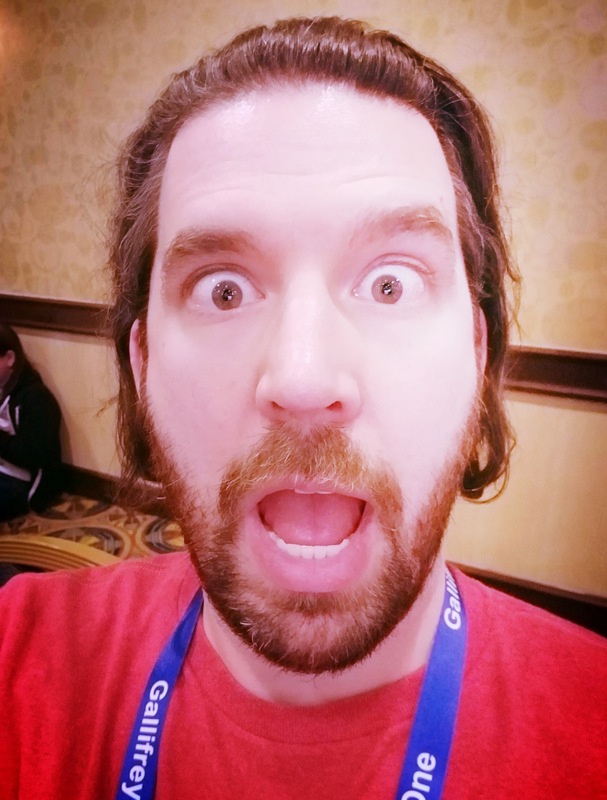 That aside, we learned some fun stuff and had a good time in our small group (it was just four of us from the convention, plus one random guy who booked the same timeslot we did). 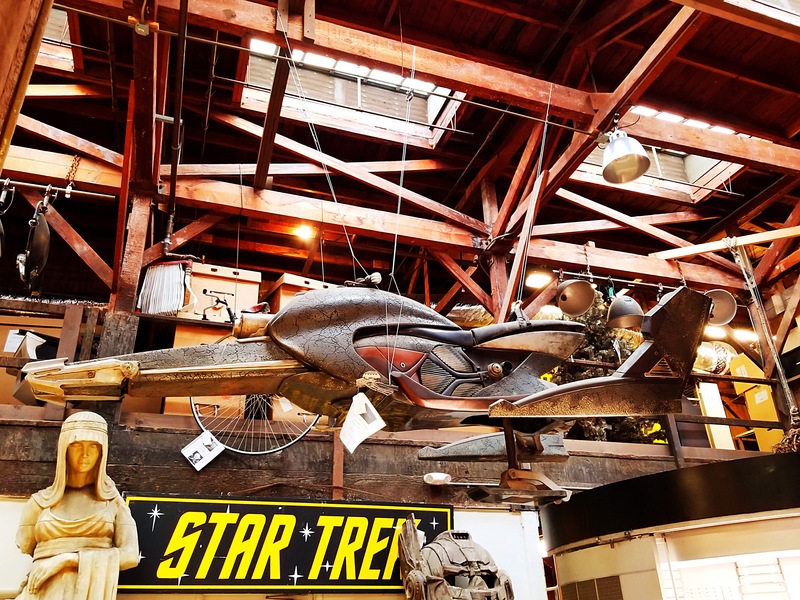 Expect to pay a visit to a “working” prop house (we were a little dubious of that claim as it felt very set up for visitors as opposed to an actual prop house), do lots of driving around in an oversized golf cart as you learn about the history of Paramount, and get a few peeks at actual sets (we walked up to one open door and got to see a little bit of one set and then stopped to see the outdoor New York City set for a little while). 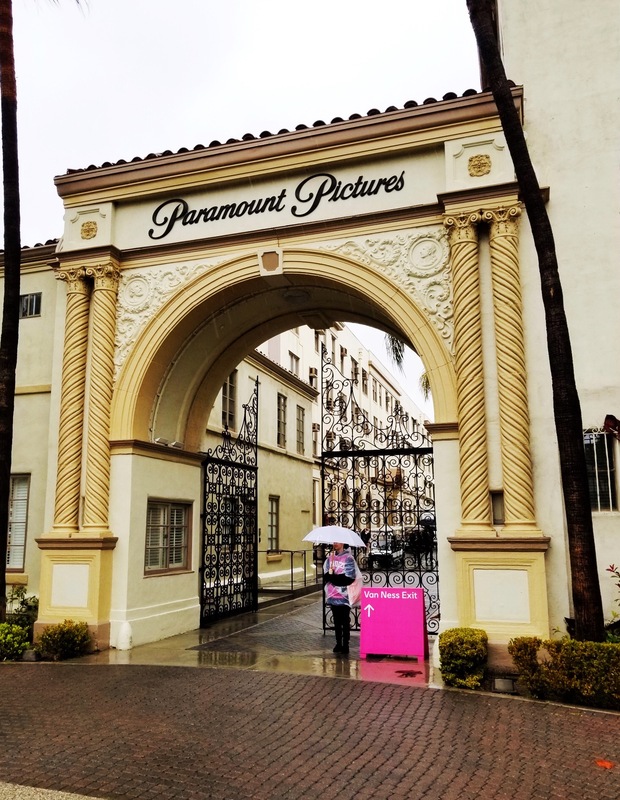 All in all, the Paramount Studio tour was fun and I’m glad we went! If you’re trying to decide which tour to do first, I would give that recommendation to Warner Bros, but your time won’t be wasted at Paramount. 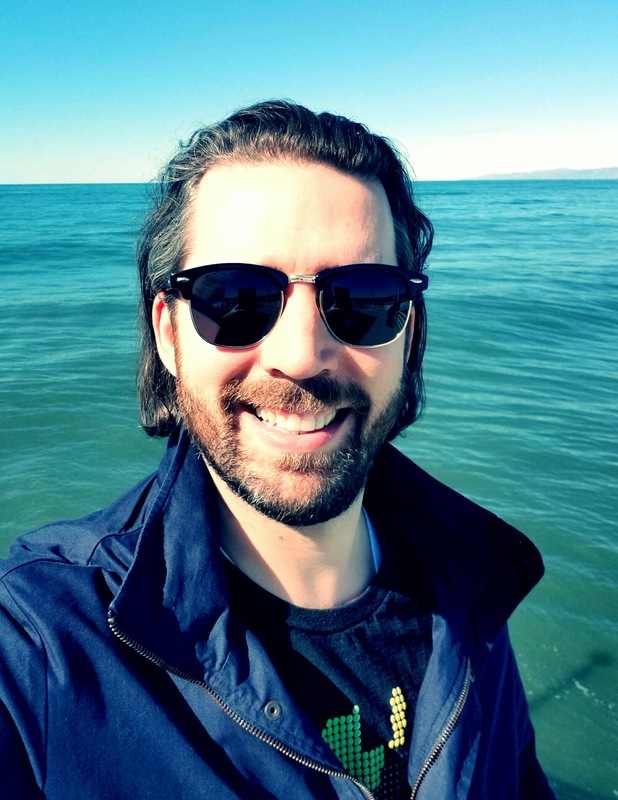 Check out my photos below to get a feel for what you’re signing up for! 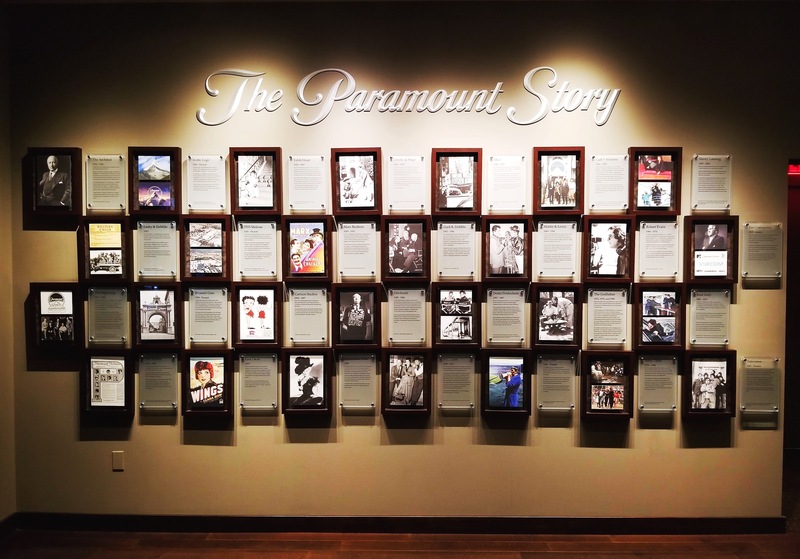 A neat timeline that chronicles the history of Paramount. I thought this part of the timeline was particularly interesting! 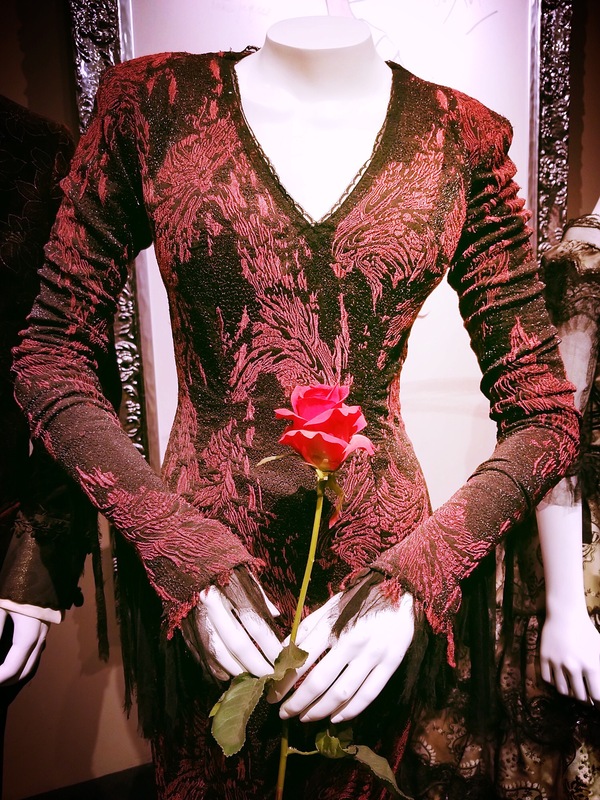 We were there on Valentine’s Day, so it felt appropriate to get a photo of Morticia’s costume (and rose) from The Addams Family. 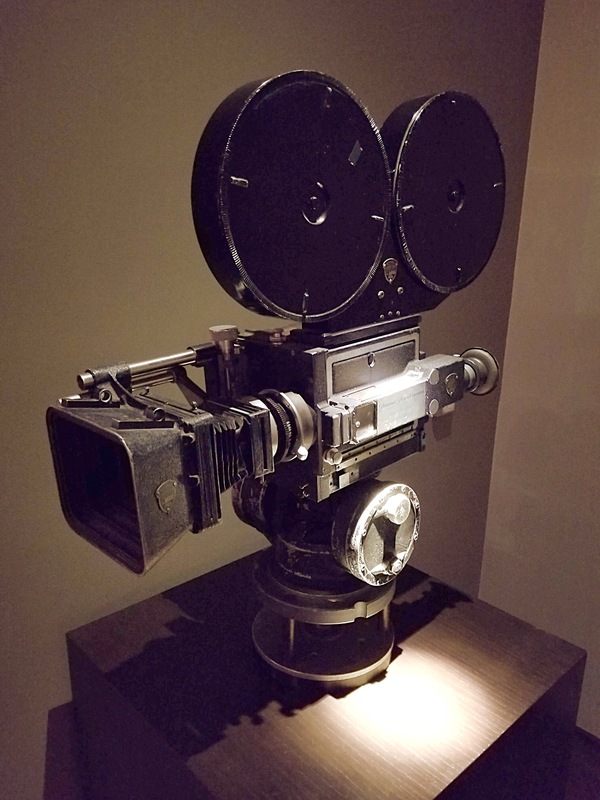 A film camera from the silent film era. 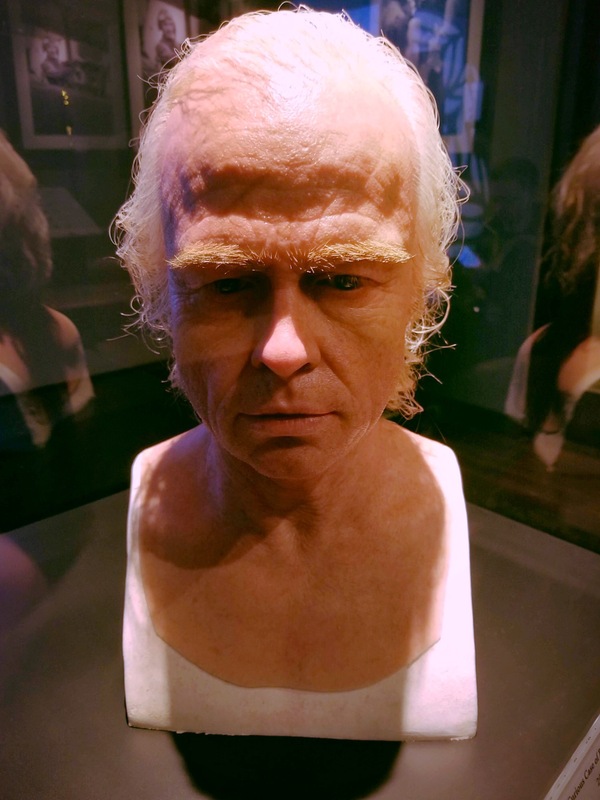 A prosthetic used in The Curious Case of Benjamin Button. 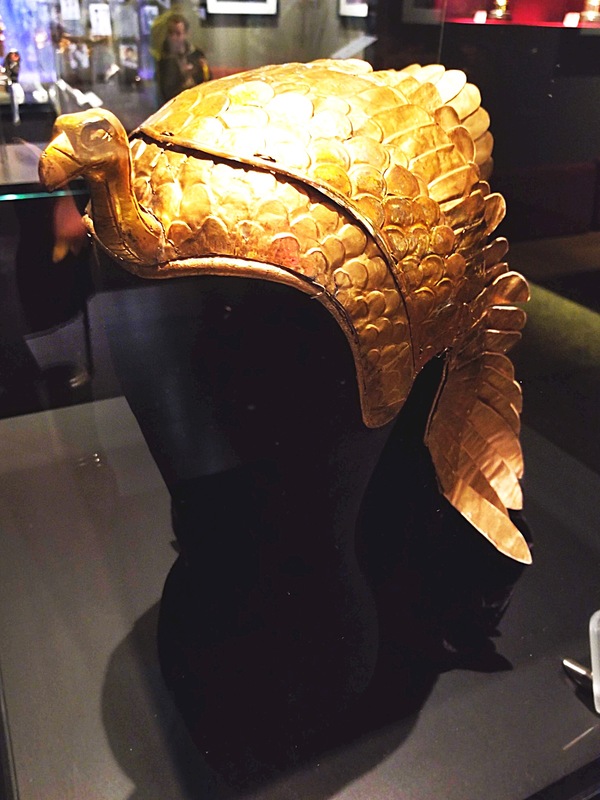 This headpiece was used, I think, in The Ten Commandments. 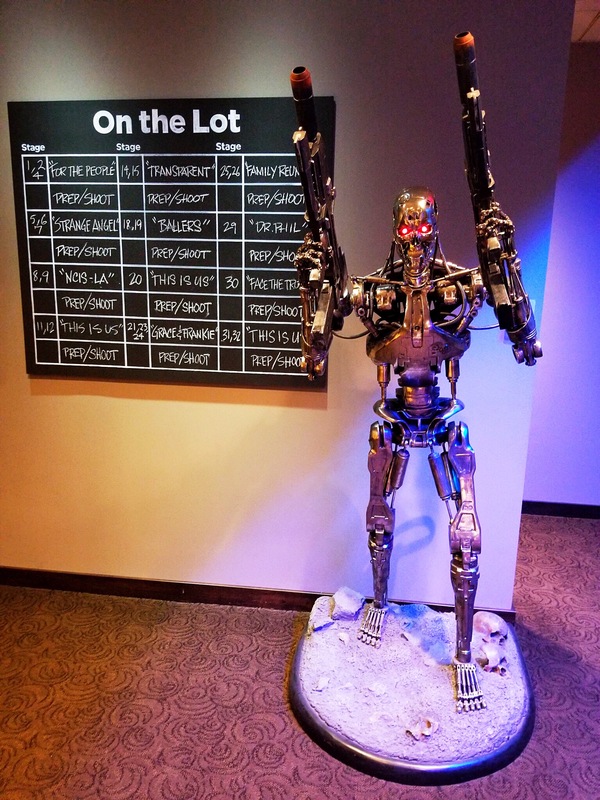 The Terminator, along with a board highlighting what’s filming on the lot. 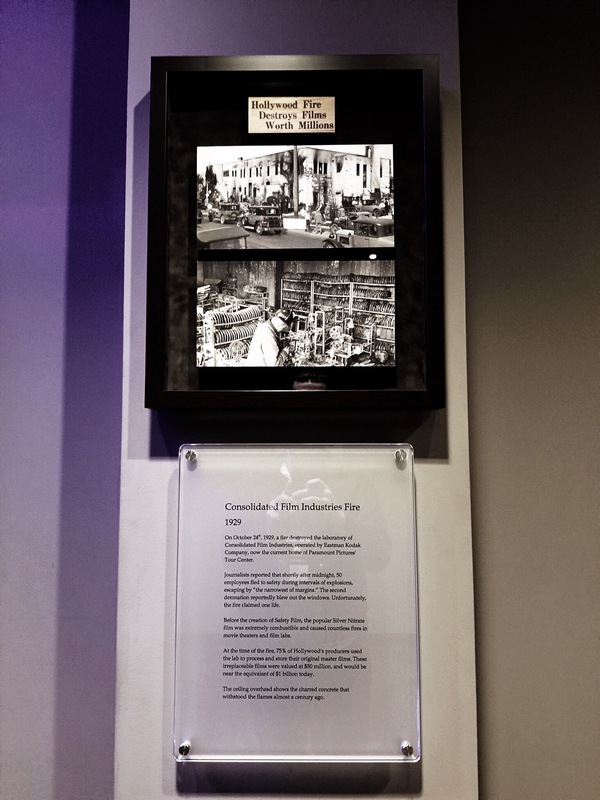 Information about a huge 1929 fire that destroyed hundreds of films forever. 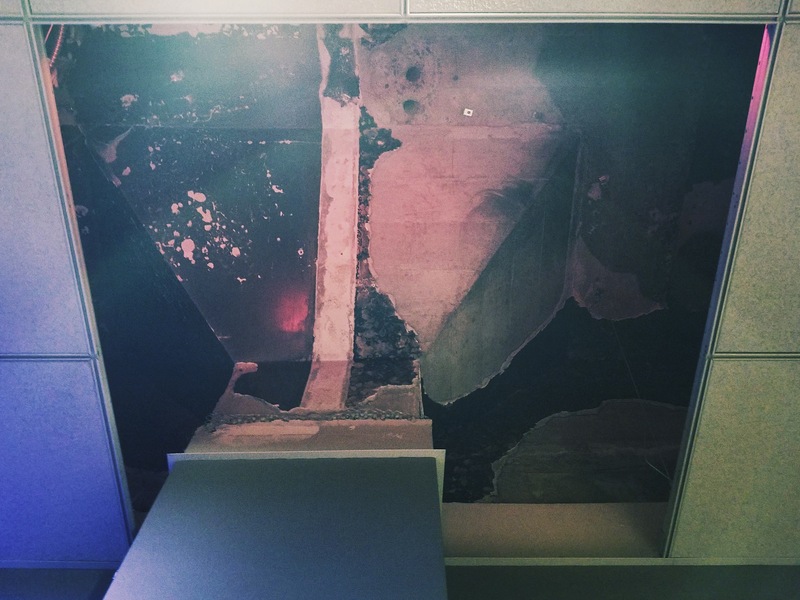 A small section of the ceiling preserved as it looked after the fire. 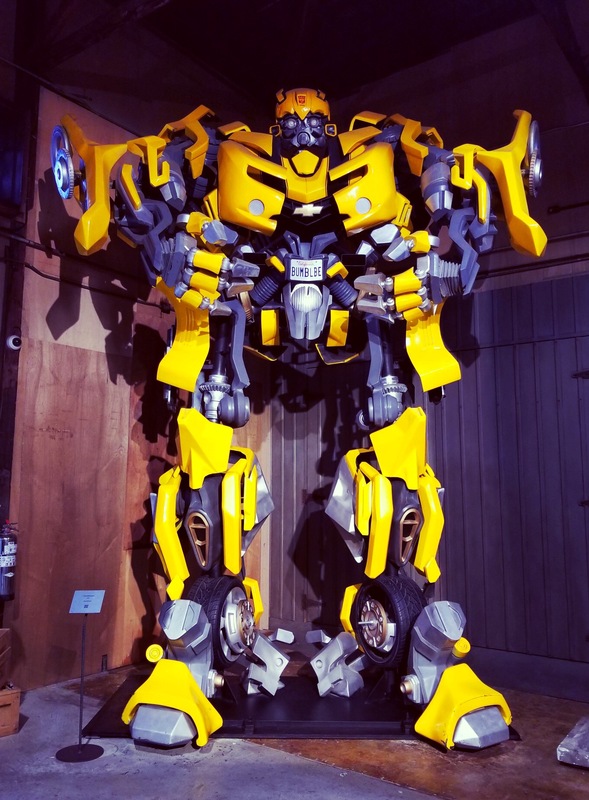 Bumblebee in the prop house. Star Trek thing, I think? 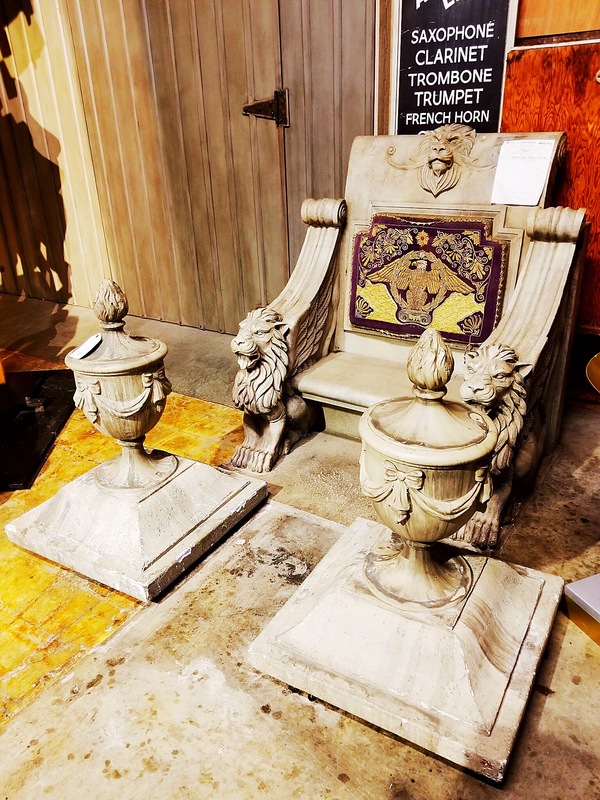 The throne from…Gladiator, I think? The famous Bronson Gate, which was the main entrance into the studio until 1978. 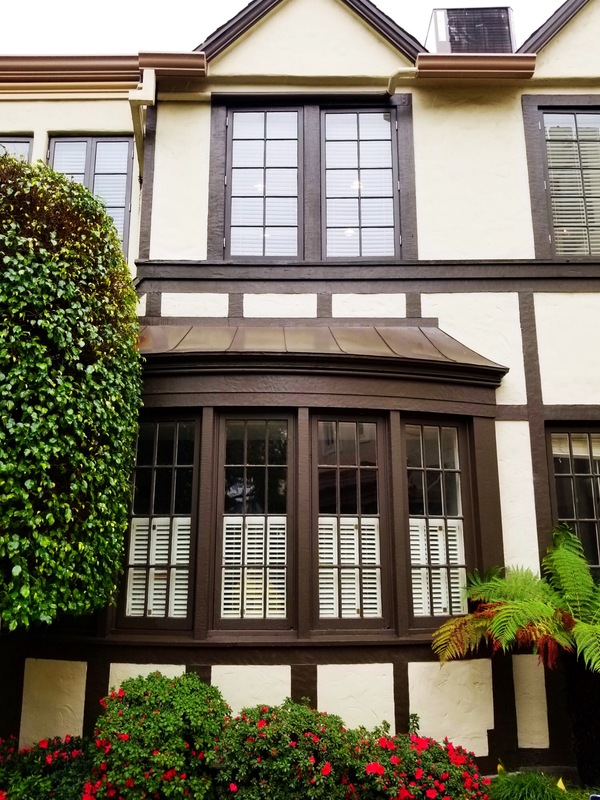 This bay window is where Alfred Hitchcock’s office was when he worked at Paramount. He was apparently very paranoid and didn’t like having a huge, ground-floor window in his office, so he had a large, purpose-built bookshelf in place that covered the entire window. The water tower (which, apparently, doesn’t have water in it anymore). 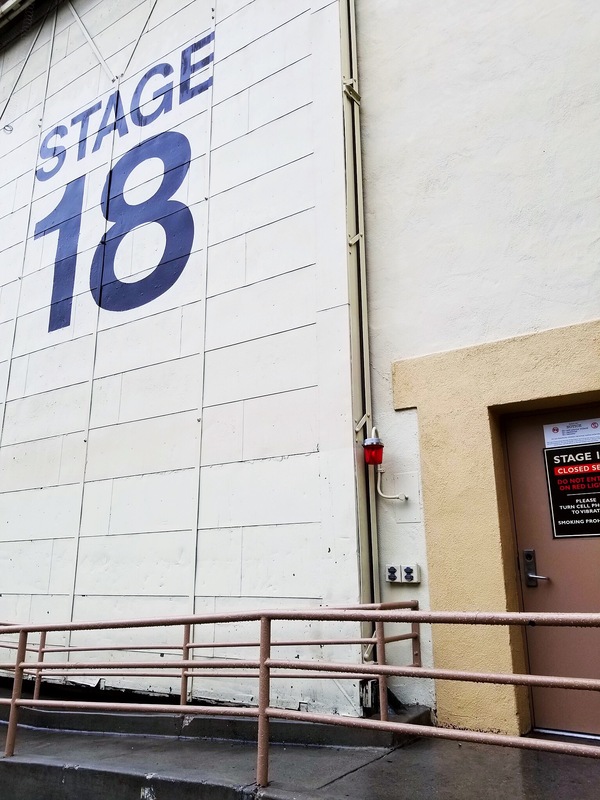 We did a quick drive-by of Stage 18, where movies such as The Graduate and Coming to America were filmed. 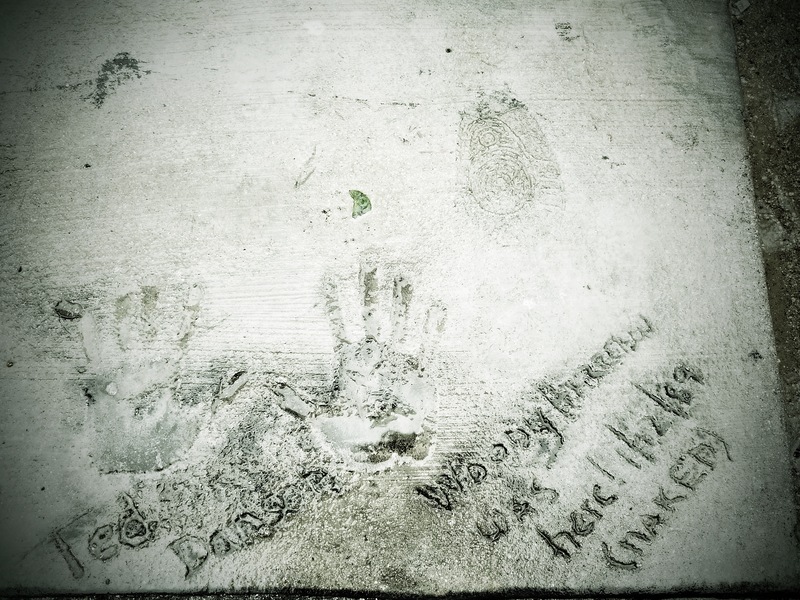 Handprints of Ted Danson and Woody Harrelson. 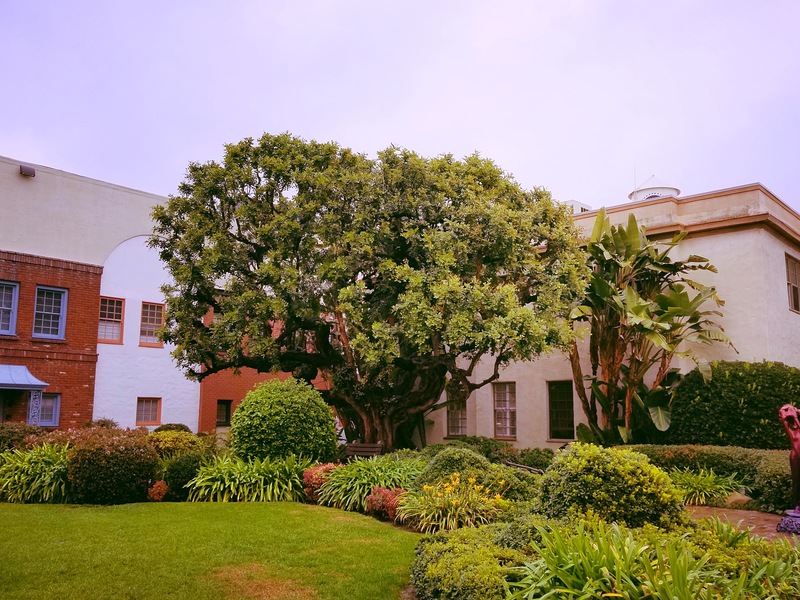 This tree was planted by Lucy and Desi in the Desilu era and was famously seen in the episode of The Brady Bunch where Greg Brady was caught smoking (gasp!). 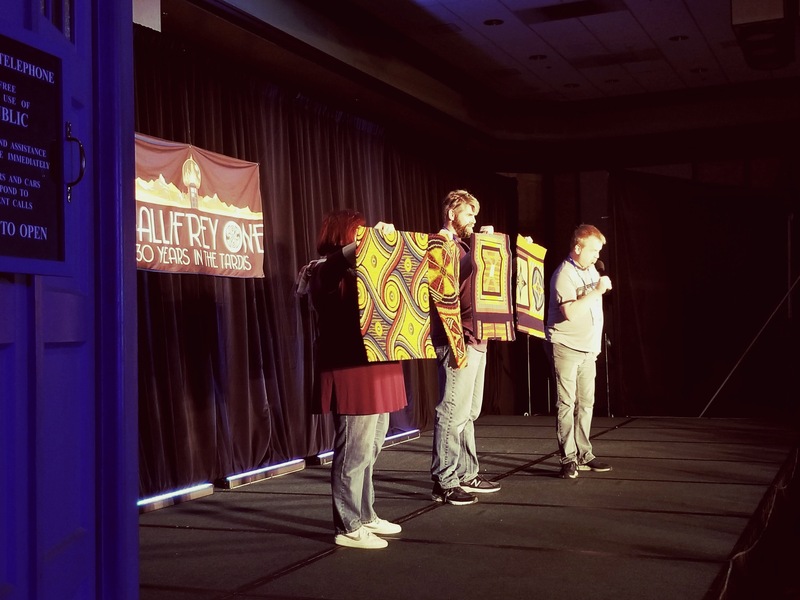 Gallifrey One (or Gally, as we all call it) was once again a success this year. 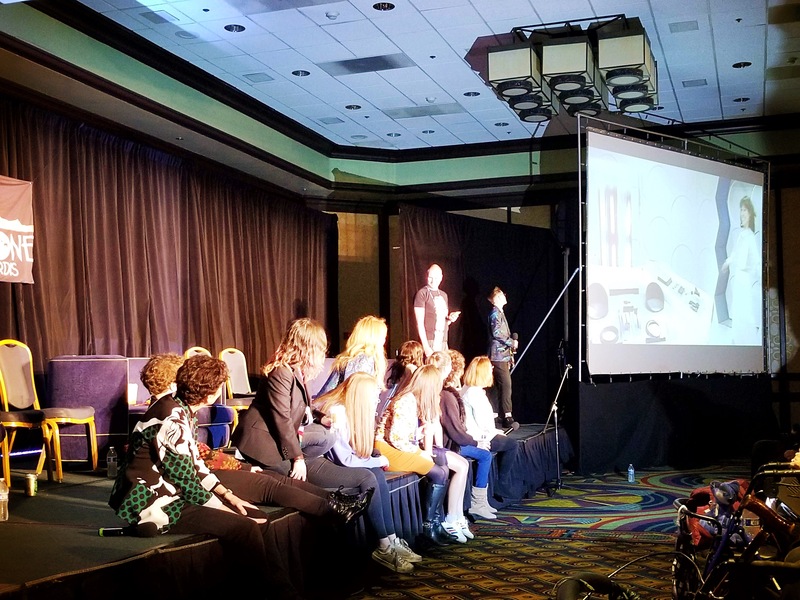 Nearly four thousand attendees and guests descended upon the LAX Marriott and enjoyed a weekend of fun, friends, panels, autographs, photos, and much more. 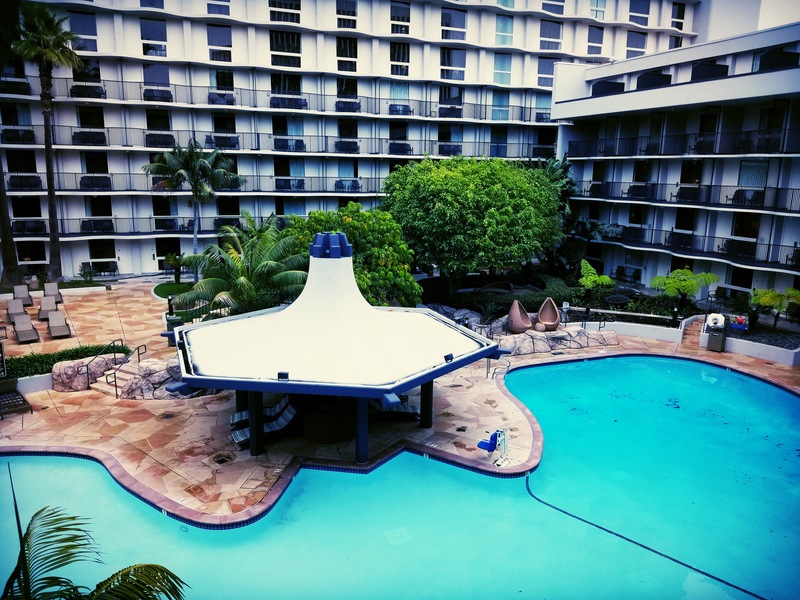 As always, I found myself having lots of fun with friends, especially as we once again had two adjoining rooms, with a third room a few doors down. In particular, my friends Matt and Jason were both back this year for the first time in a few years and it was so great to see them! Also as always, I wasn’t just having fun at the convention, but I was working, too! Wearing my guest liaison hat for the weekend, I had the chance to work with both Yasmin Bannerman (who had a guest spot in second episode of the modern series in 2005, in addition to doing audio work for Big Finish) and Lisa Greenwood (a companion to the Sixth Doctor in his audio adventures for Big Finish) and they were both delightful. 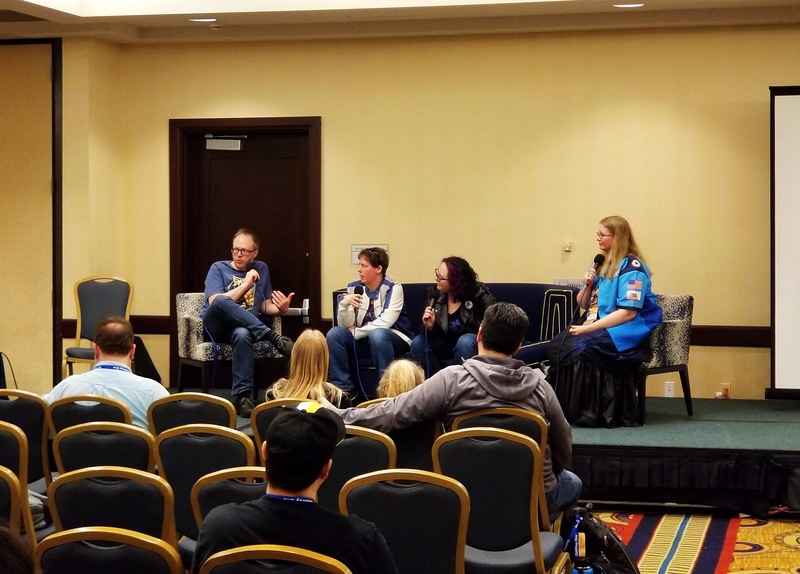 Although it technically is “work” I have a lot of fun in my “official” capacity at conventions like this and I look forward to the wide variety of guests I get to work with. 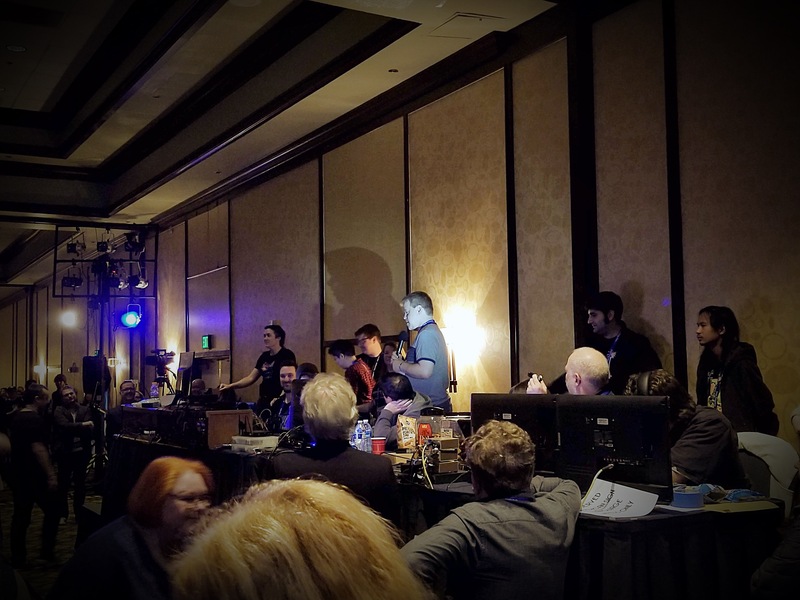 As always seems to be the case with conventions, the best way to tell the story of how my weekend went is to share my photos. Enjoy! 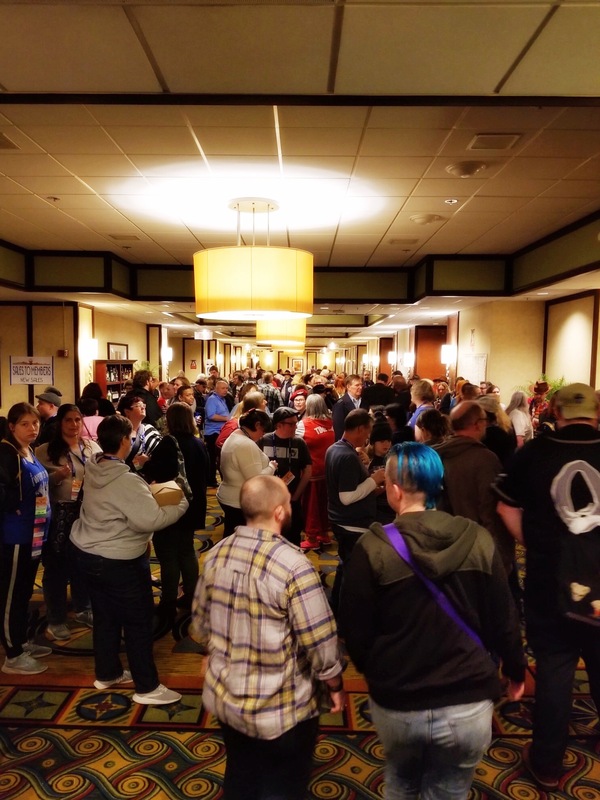 Lots of people on the convention level of the hotel on Thursday night! Also on Thursday night (and Friday and Saturday) – karaoke. 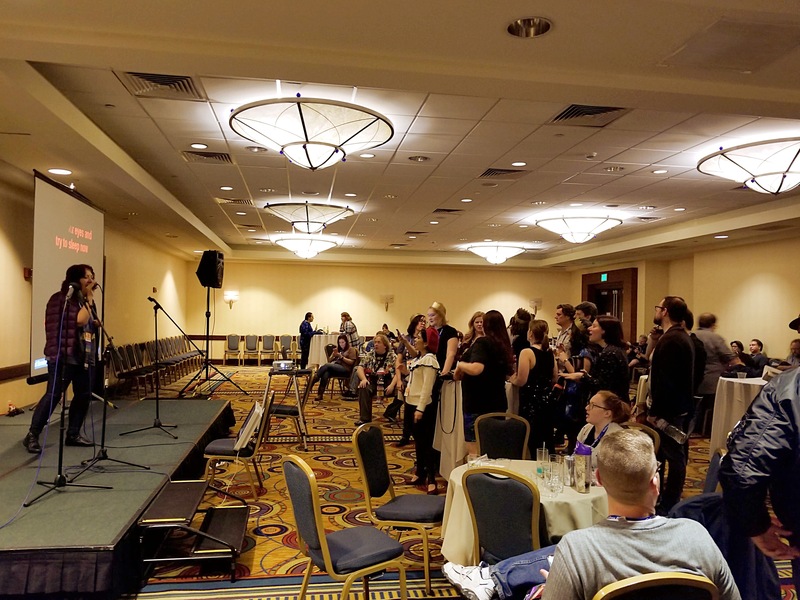 I’ve been going to this convention long enough to remember when karaoke was just one night in a small function space and it was easy for us to sing more than once. 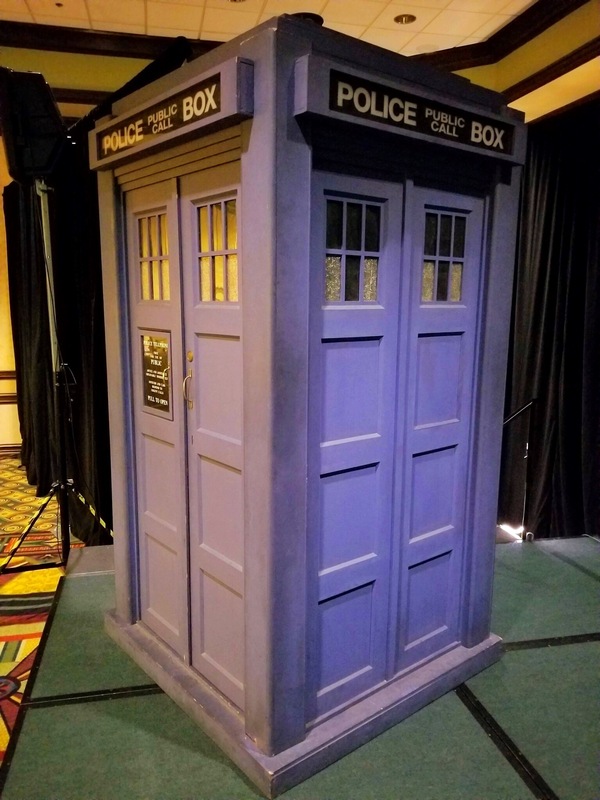 I hopped onto the main stage before things got going to get a nice photo of the TARDIS. 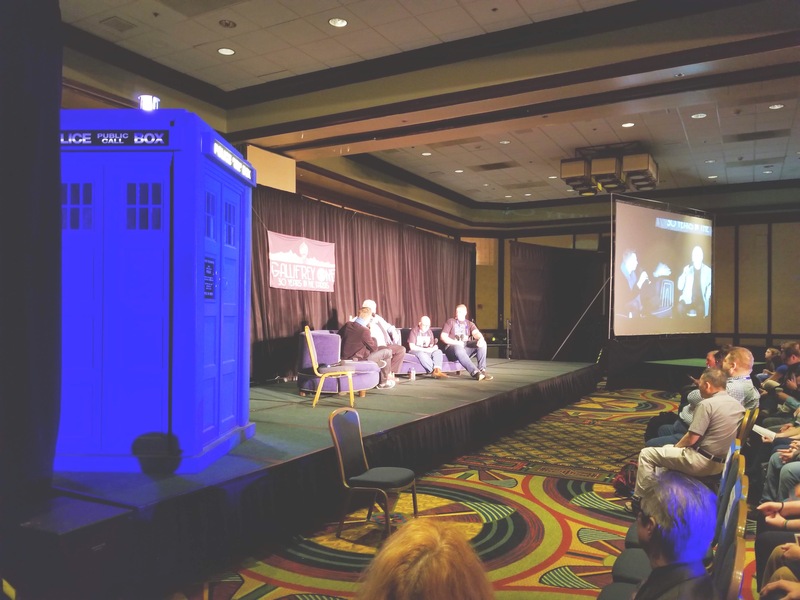 The boys from Radio Free Skaro interviewing Sixth Doctor Colin Baker on the main stage (obviously taken after the photo above!). I made a quick stop in the photo studio to get a photo with Catherine Tate, who played one of my all-time favorite companions, Donna Noble. She’s the best! 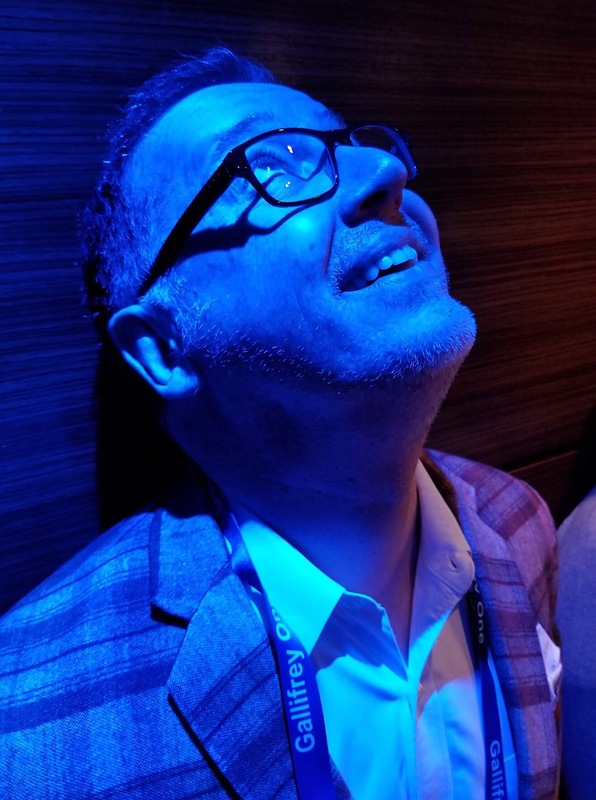 The elevators had some trippy blue lights, so I took this artsy photo of Matt. A very full house for one of the main stage events. 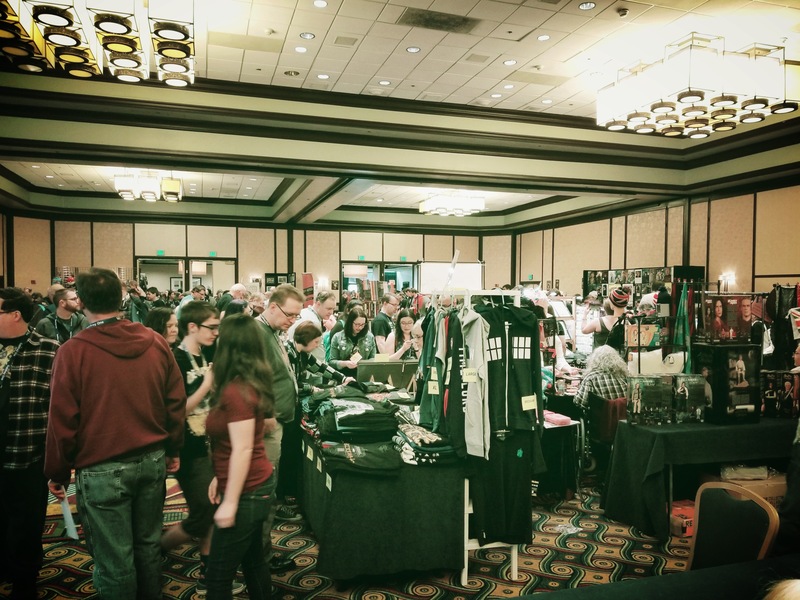 Passing through the also-busy dealers room. 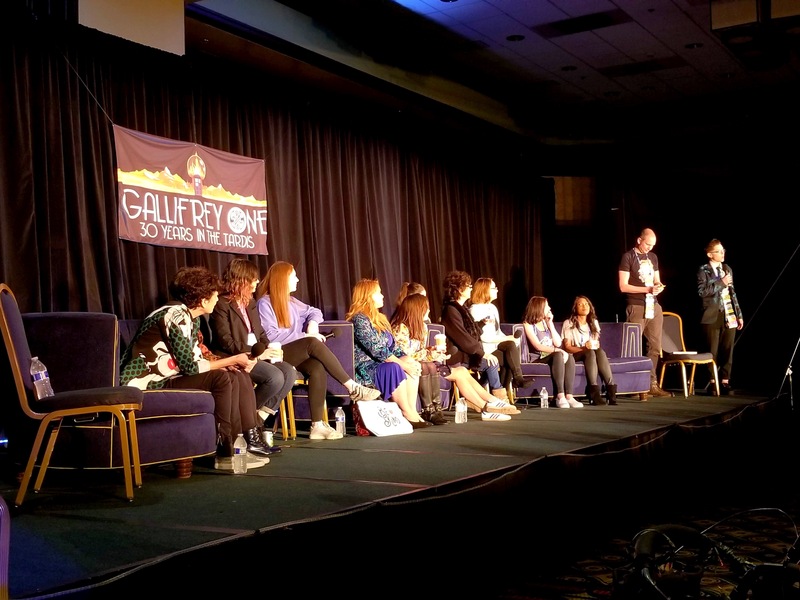 Main stage panel featuring actors from the Sixth Doctor era. I made sure to get up close for a photo of Catherine’s one-woman show. 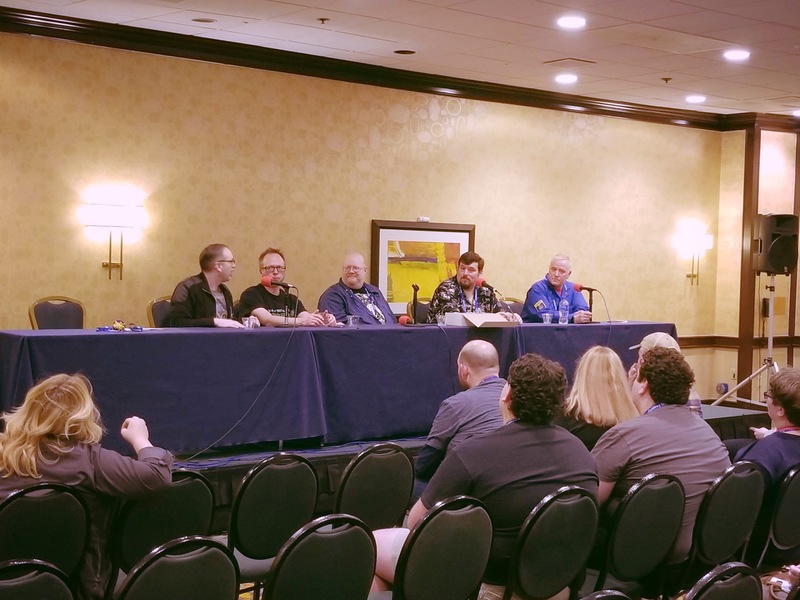 Stopping in to check on Bill’s Friday night panel about Mystery Science Theater 3000. A random room photo with Felicity’s purchase from the dealers room. 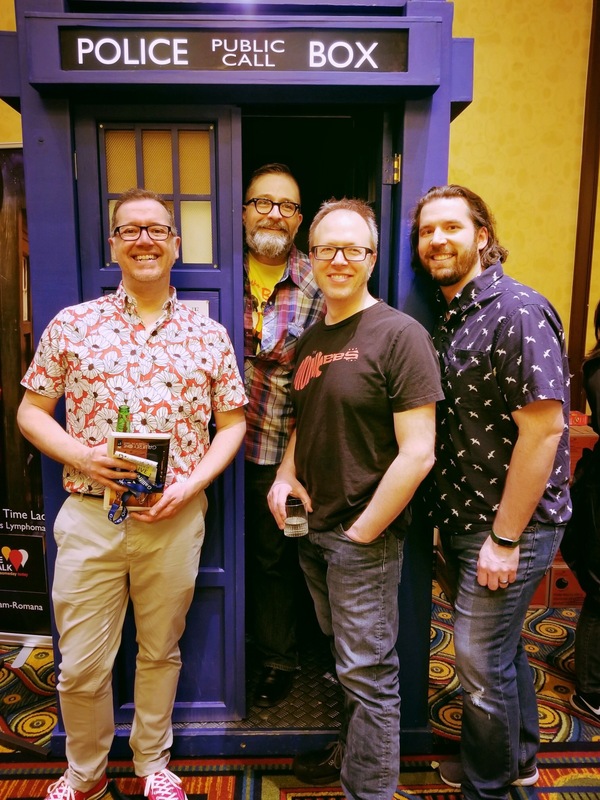 Saturday photo with my boys and the TARDIS! I’m terrible about getting photos of all the fabulous costumes I see at conventions, but I made sure to snap this photo, which features costumes from the Fourth Doctor story The Stones of Blood. Another stop in the photo studio! This is Yasmin, one of the guests I worked with this year. 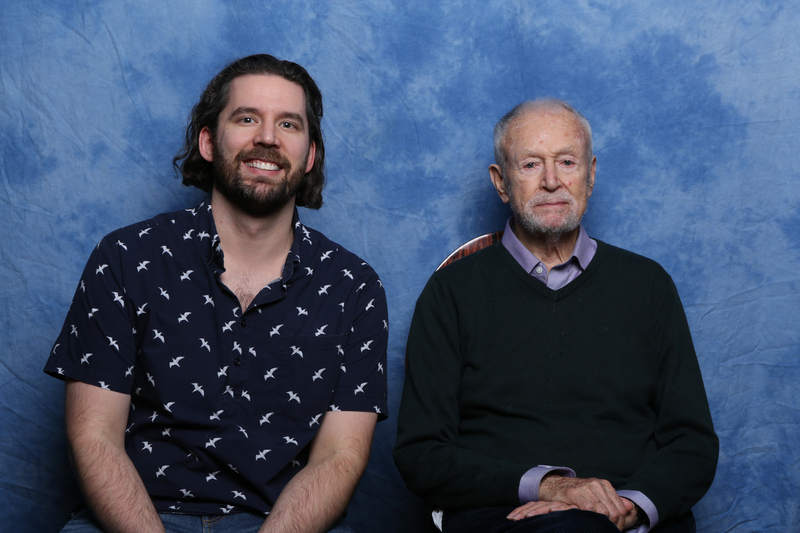 And my final photo studio stop was to get a photo with William Russell, who I realize doesn’t exactly look enthused here, but he’s 94 and traveled a long way to get to the convention. He was one of the original three companions back in 1963! 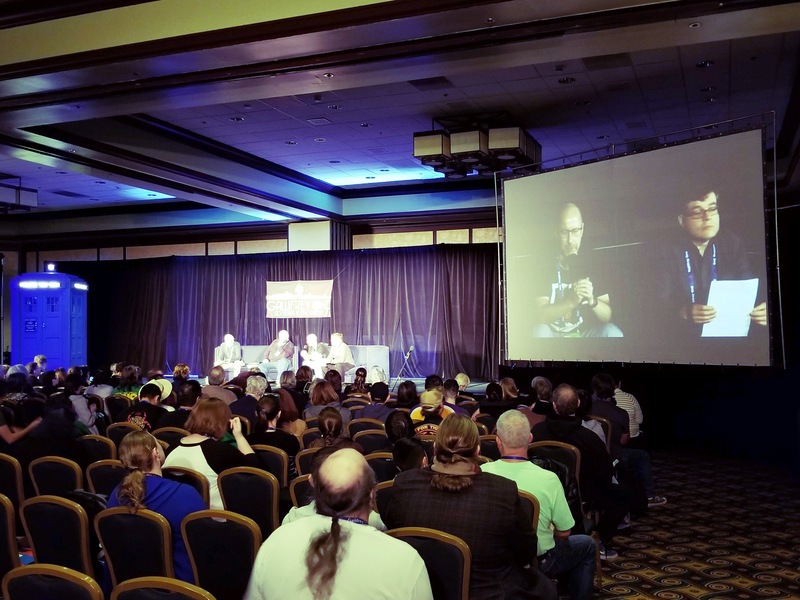 Next panel – a preview of upcoming Blu-ray releases. So good! The Restoration Team puts a LOT of work into restoring the video and audio of classic Doctor Who stories for release on physical media. They’re always fascinating to listen to! 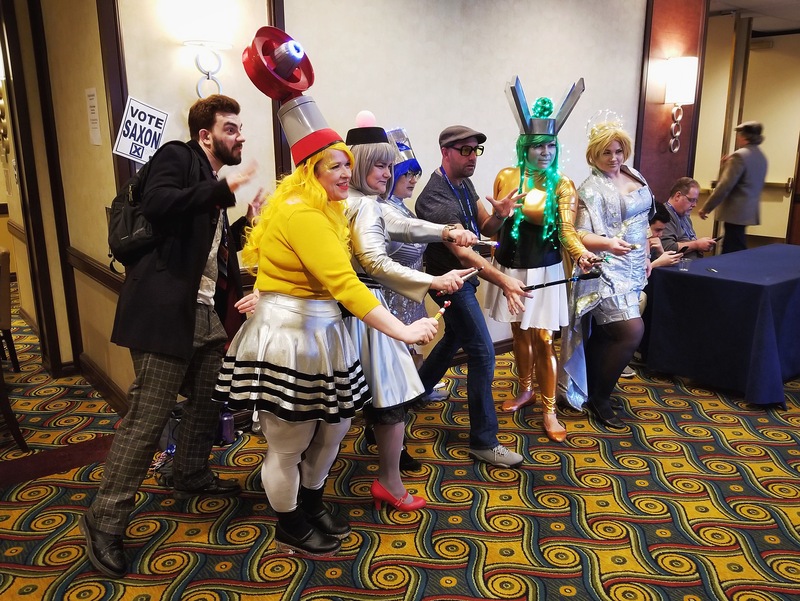 Another cosplay photo – these folks were all dressed as different versions of the Doctor’s trusty sonic screwdriver. I stole this photo from Matt because it’s so fun! 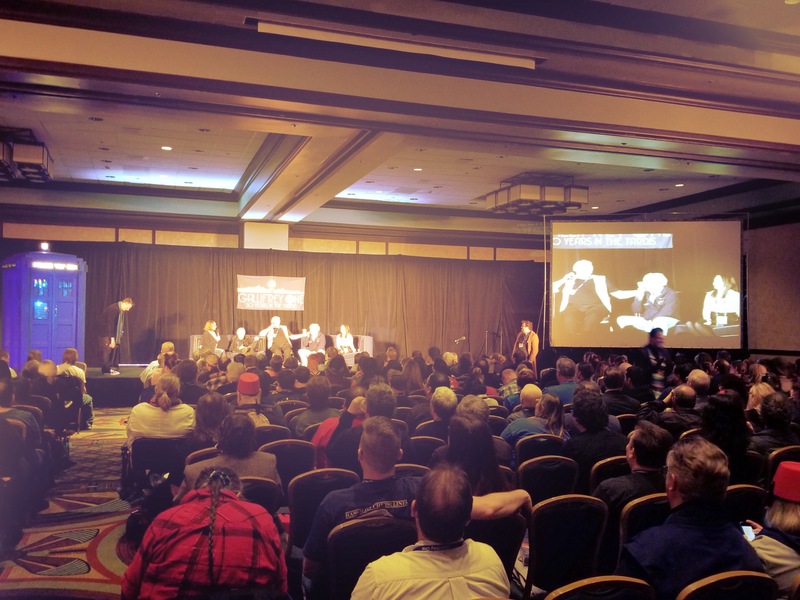 Bill’s Sunday afternoon panel about Star Wars. 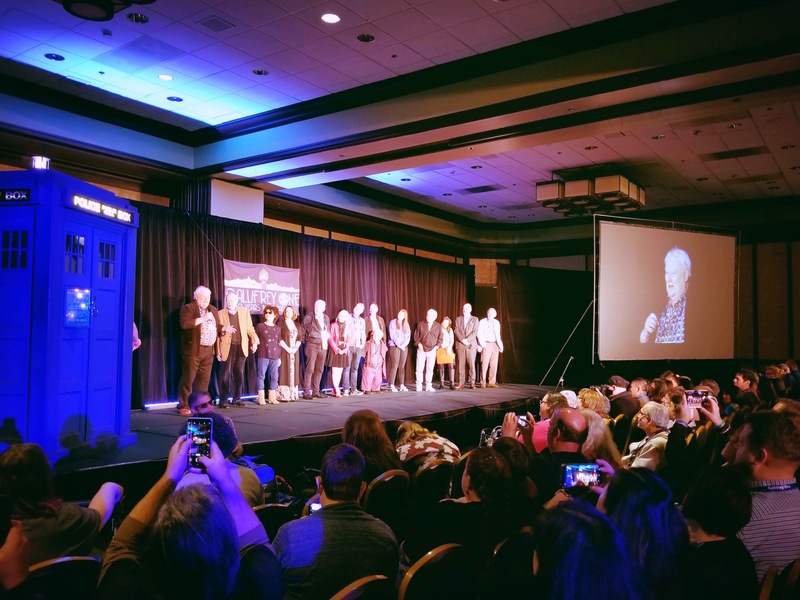 A collection of fierce females talking about women in Doctor Who. 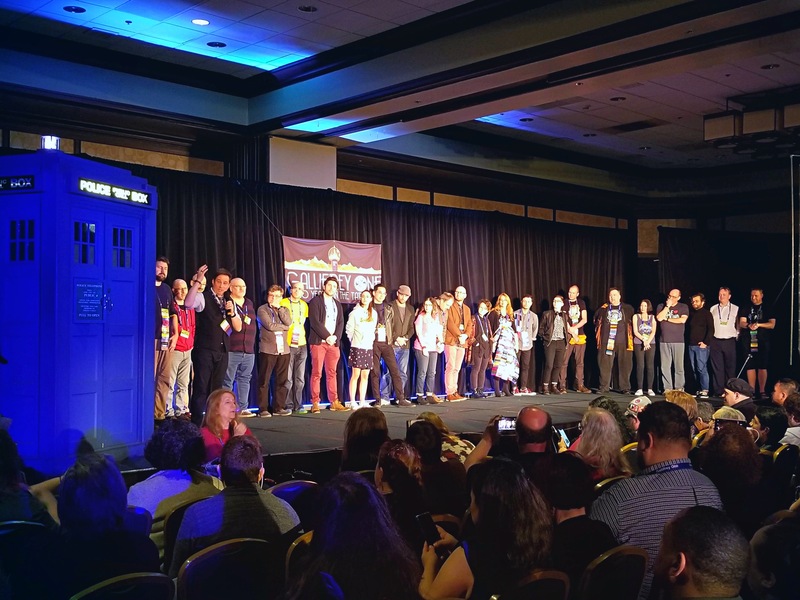 Everyone moved to the edge of the stage to watch the cool video highlighting the accomplishments of women in Doctor Who. 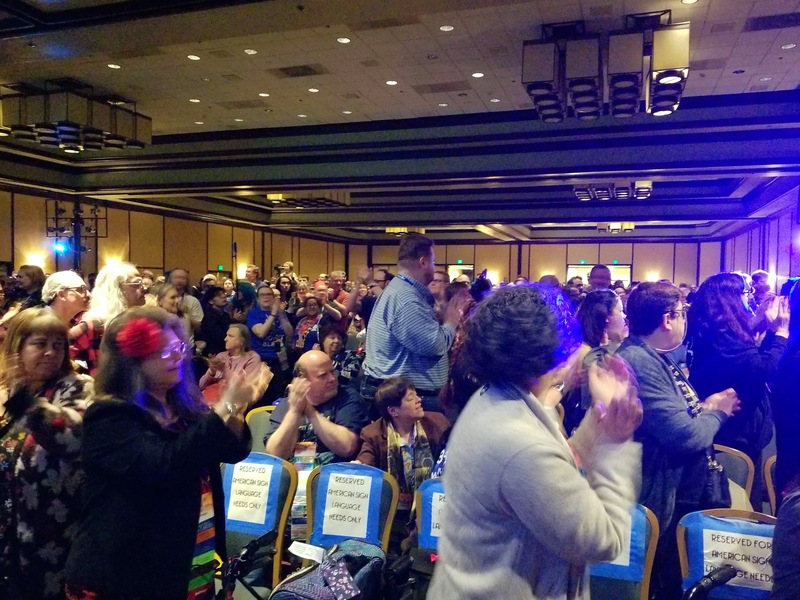 My friend and Gallifrey One showrunner Shaun Lyon reacting to the surprise video shown before the closing ceremony, highlighting his outstanding work over 30 years of Gally. And here’s our reaction to Shaun! 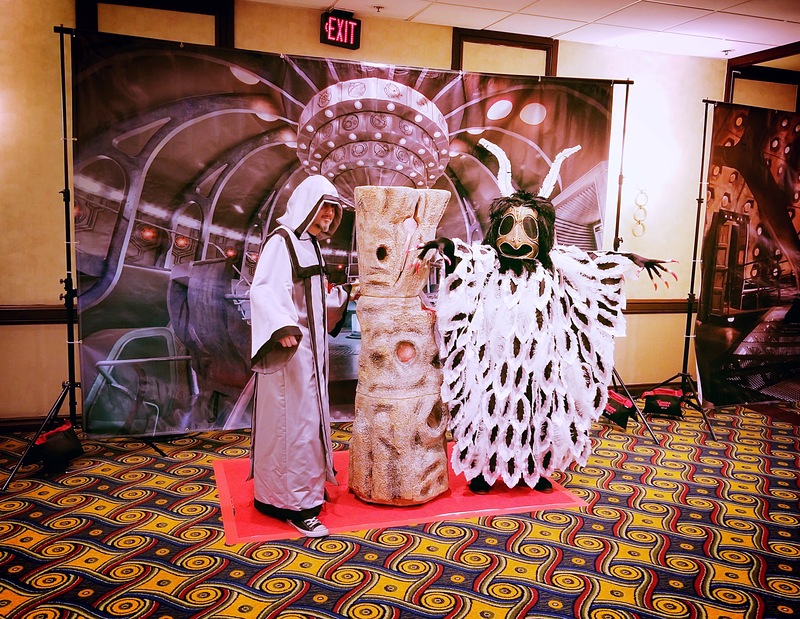 Shaun, along with convention staff members Joyce and Dan, with a few sections of the (in)famous carpet from the hotel’s convention level, which will be gone by the time Gally 2020 rolls around. The first batch of guests saying goodbye during the closing ceremony. Goodbye from more of the guests. 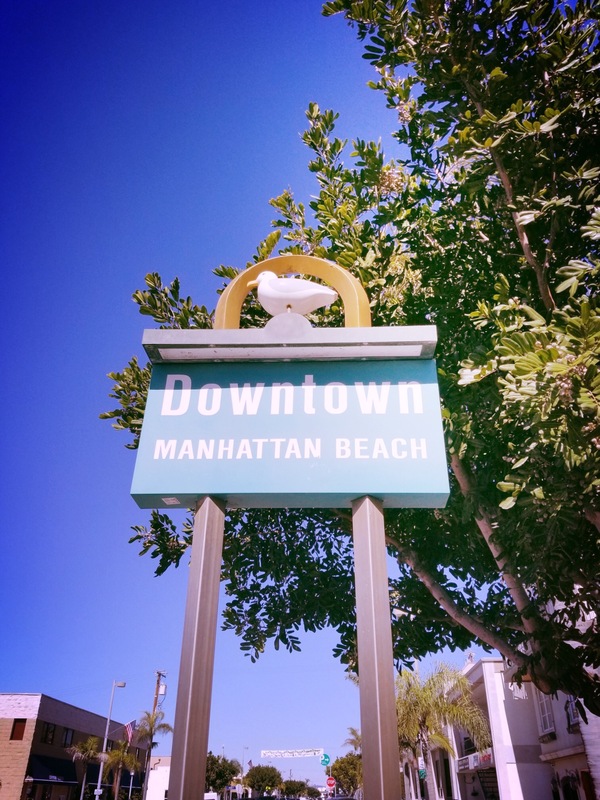 See you in 2020! 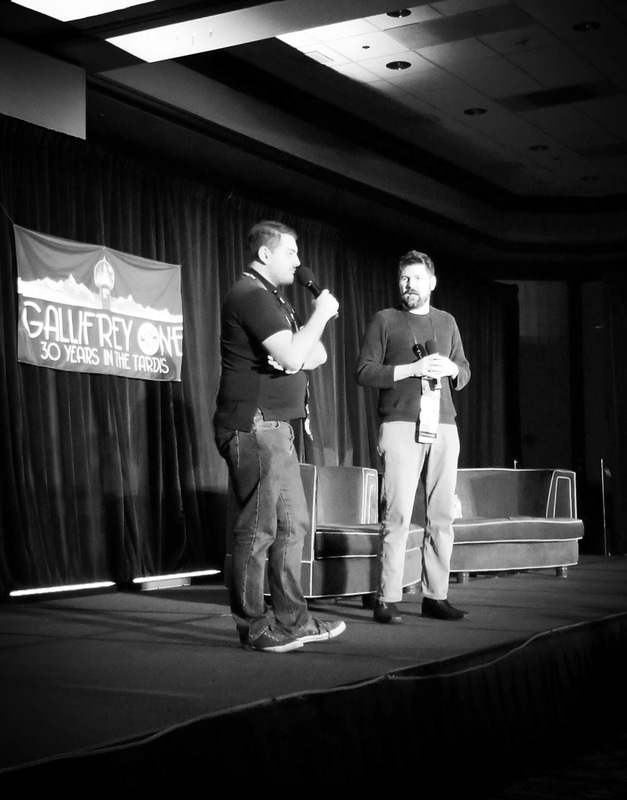 And that brings us to the end of another excellent Gallifrey One. I’m already counting down to next year! 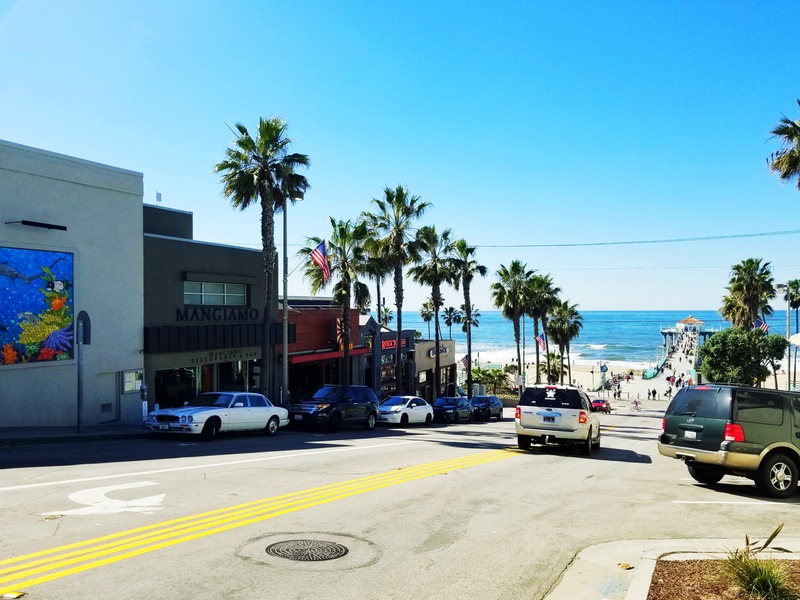 Although I normally fly home the Tuesday after the convention, I flew home the Monday after this year, which didn’t give me much time to do anything extra (aside from the aforementioned trip to Paramount). 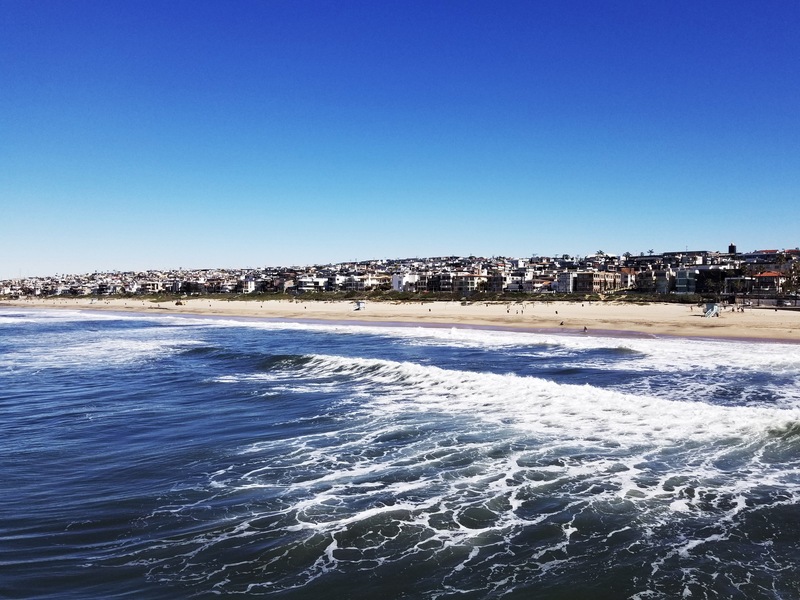 However, with my flight leaving in late afternoon, Jason’s leaving in the evening, and Matt’s not leaving until Tuesday, we did decide to pay a quick visit to the Manhattan Beach Pier to enjoy the sunshine. 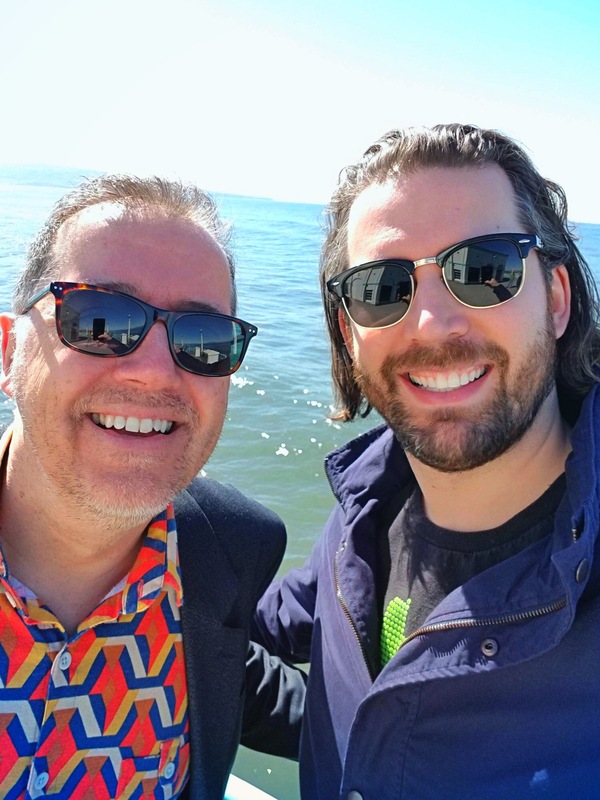 It wasn’t hot by any means, but it was great to soak in a little California sun before we parted ways! 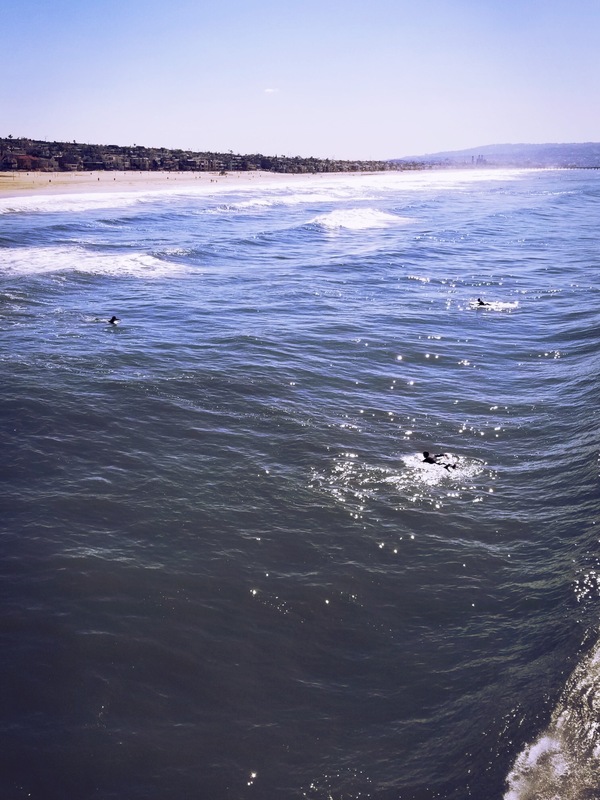 Nice waves seen from the pier. Cute sign we saw while walking around to find a place for a drink/meal. 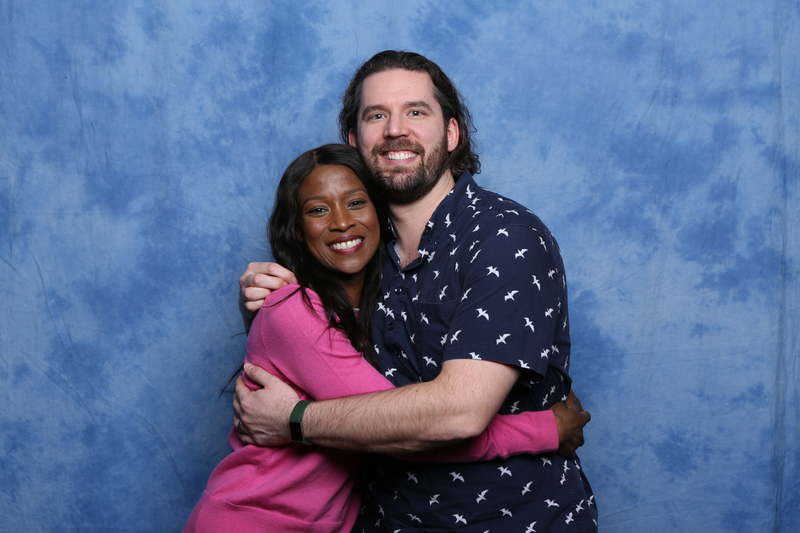 And that’s the real end of my entire Gally 2019 experience. Roll on 2020!